Right up front, I’m gonna tell you that Drive Angry is one of the finest drive-in flicks in many a year, and it’s a damn shame the drive-in circuit no longer exists (at least in any meaningful way) because this movie deserved to make more money at the box office than it did, and I think it would’ve raked it in as a summer drive-in exploiter. A balls-to-the-wall, grocery-deliverin’, non-stop example of relentless forward motion, Drive Angry would make a spectacular double-bill with Race With the Devil or even Larry Bishop’s under-appreciated drive-in throwback, Hell Ride (2008). I realize a lot of people throw around the words retro and grindhouse and whatever the hell else to describe a lot of movies that really don’t live up to such labels but Drive Angry wears its old school status well without it ever seeming forced or like an affectation. I also can’t help but wonder if the movie’s boxoffice was hurt by the 3D – a movie like this would have enough trouble finding its audience without the added bonus of inflated ticket prices – I saw the flick in good old-fashioned 2D on my TV last night and I don’t feel like I missed out on anything, or that my enjoyment would have been jacked up proportionally by that extra dimension (at least not enough to make it worth paying 16 bucks or 20 bucks or whatever a 3D ticket costs these days). 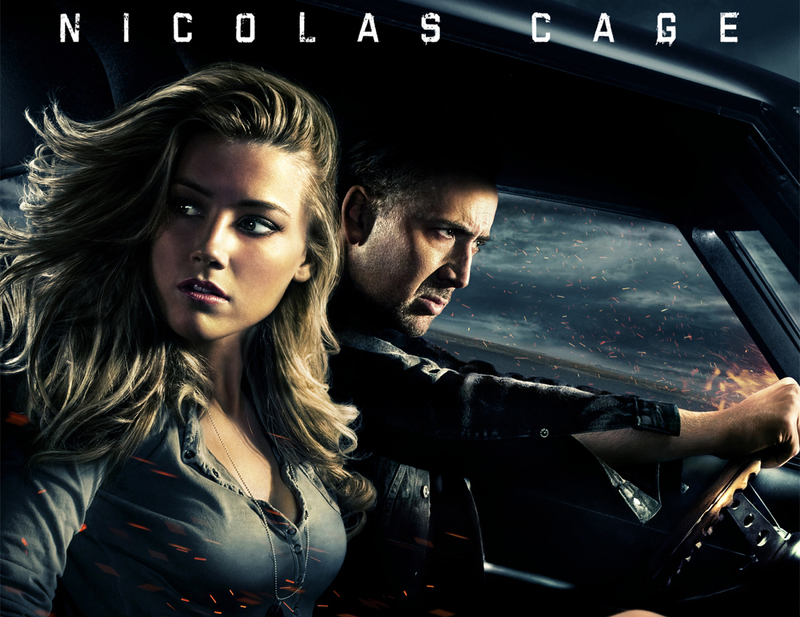 Drive Angry opens as Nicolas Cage (playing “John Milton,” of all things) escapes from Hell in a Buick Riviera. Immediately, we’re treated to some car chase action and a violent shootout as Milton confronts a few henchmen of cult leader Jonah King (Billy Burke). King, y’see, murdered Milton’s daughter and stole her baby girl, and Milton is on the vengeance trail, aiming to rescue the baby before she’s sacrificed on the night of the full moon in order to open Hell on Earth. Milton, however, is being pursued by one of Satan’s “accountants” (played by the always-terrific William Fichtner), and the clock is ticking for everyone. Milton stops off at a small-town diner where we meet waitress Piper (Amber Heard) and her horny co-worker, Norma Jean (Katy Mixon, who is really good in what could’ve been a thankless role). Norma Jean hits (hard) on Milton, who has more important things to worry about – like the dude who works for Jonah King sitting at the counter. Milton splits and Piper’s boss hits on her, so she walks out – and man oh man, does she look good in her cutoffs and cowboy boots. One of my favorite scenes. Uh, because of the car. Climbing into her Dodge Charger, Piper takes off. The car breaks down and Milton strolls up, offering to fix the beast in exchange for a lift. They arrive at the ol’ trailer park Piper calls home and Milton goes on his way as Piper scurries into the double-wide to see her sweet lovin’ man, Frank (screenwriter Todd Farmer, more naked than any screenwriter ever ought to be). She interrupts Frank in the midst of boning a young lady (Christa Campbell), and more delicious groceries are delivered as Piper punches out the naked chick. As Frank tries to claim that Piper forced him to cheat on her, the two wind up in a brawl. Milton intervenes, kicking the crap out of Frank, and he and Piper hop into the Charger and hit the road, heading for Stillwater, Louisiana – and the abandoned prison where Milton’s granddaughter is to be sacrificed. Along the way, Milton and Piper stop at The Bull by the Balls, an oddball combination of country bar and motel. Milton is hit on by yet another horny waitress and Piper picks up the busboy, forcing him to paint her toenails. Piper’s antics are interrupted by all the racket coming from Milton’s room next door, however, and soon we’re watching one of the most ape-crazy goddamn action scenes I’ve ever seen, wherein Nicolas Cage shoots it out with a passel o’ bad guys – all while continuing to screw the waitress. Soon, Milton and Piper are being pursued not only by Hell’s Accountant but by a whole bunch of angry cops, led by the great Tom Atkins (of many a John Carpenter movie) – who makes his first appearance wearing a t-shirt bedecked with dozens of famous spoilers from various movies. Atkins tears it up in this role and he’s always fun to watch. Throw in a little help for our heroes from David Morse and things are really hoppin’. And one more shot of that, uh, car. It’s really rare that I see a modern exploitation movie that’s this much friggin’ fun to watch – in fact, around the point of the Bull by the Balls sequence, I remember thinking to myself Please hold up please hold up please hold up because I’m so used to being let down by movies that start out cool and then fail to maintain the goodness (so to speak). Drive Angry is so full of crazy stuff – again, without ever seeming like it’s trying too hard (The Crow: Wicked Prayer and Hobo with a Shotgun, I’m looking at you) that it’s simply a pure delight from start to finish, and it really seems like everyone involved – cast, director Patrick Lussier and of course Todd Farmer (whose glee at what he’s getting away with pretty much explodes out of every scene) – is having a great time. There are car chases, gun fights, muscle cars, explosions and/or hot chicks in nearly every scene, and if I had one complaint it’s that Amber Heard never gets naked.